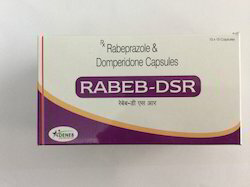 Manufacturer of a wide range of products which include rabeprazole domperidone (rabeb - dsr capsules), pantoprazole domperidone (pentaneb - dsr capsule), omeeneb capsule, itraneb capsule 200 mg, itraneb capsule 100 mg and omeeneb-d capsule. Acute nausea and vomiting, Dyspepsia, Functional dyspepsia, Gastric distension pain due to pressure on the stomach, Gastro-oesophageal reflux disease, Nausea and vomiting, Nausea and vomiting (chemotherapy induced), Nausea and vomiting (L-dopa induced), Non-ulcer dyspepsia, Reflux oesophagitis. With the help of highly skilled professionals, we are engaged in offering a qualitative assortment of Pentaneb - DSR Capsule. These capsules are used to treat erosive esophagitis (damage to the esophagus from stomach acid), and other conditions involving excess stomach acid such as Zollinger-Ellison syndrome. It helps heal acid damage to the stomach and esophagus, helps prevent ulcers, and may help prevent cancer of the esophagus. Owing to our vast industry experience in this domain, we are engaged in offering Lyconeb Capsule to our valuable clients. Our offered capsule is used in cancer prevention and cardiovascular disease has been widely documented. Its powerful antioxidant actions are effective in maintaining the strength, thickness, and fluidity of cell membranes. In tune with industry norm, we offer the entire array in diverse packaging options at nominal prices. Lycopene is used in nutritional deficiencies.Owing to our vast industry experience in this domain, we are engaged in offering Lyconeb Capsule to our valuable clients. Our offered capsule is used in cancer prevention and cardiovascular disease has been widely documented. Its powerful antioxidant actions are effective in maintaining the strength, thickness, and fluidity of cell membranes. In tune with industry norm, we offer the entire array in diverse packaging options at nominal prices.